Here is a waterfall photo sent to me from Jim Chamberlin. 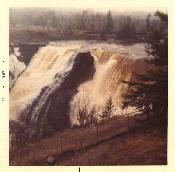 He said: "I was looking for details on Kakabeka Falls and came across your page. Back in 1973 while on a motorcycle trip from Illinois to the tricentennial at Moosonee I happened to take this picture of the falls. I actually took two shots with my very high tech Kodak X-15 Instamatic; however, only one had this interesting likeness of the princess." ( See the Legend of Greenmantle, the princess of Kakabeka Falls. )You may click on the thumbnail to see a larger version of the waterfall.